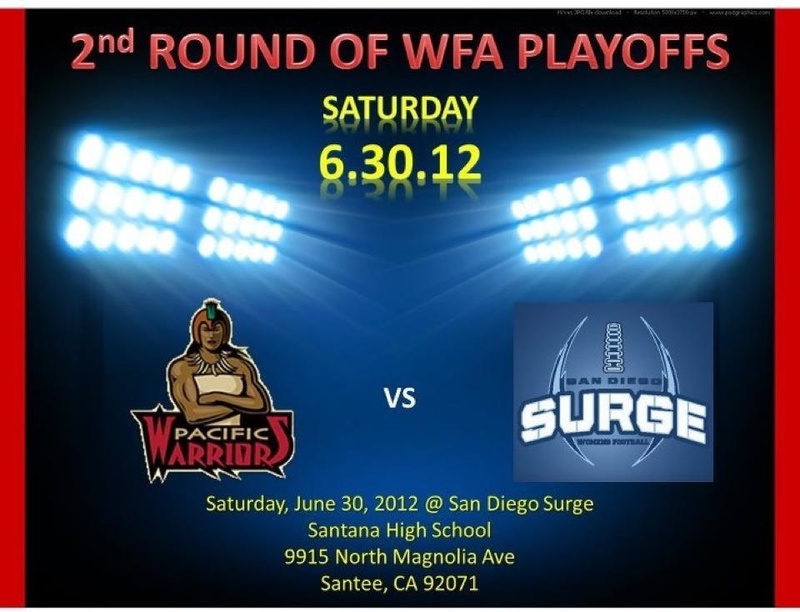 After dominating the regular season, the San Diego Surge (8-0) are now on a mission to make their second consecutive trip to the WFA National Championship. Their journey will begin this Saturday when they host the Pacific Warriors (6-3) in the 2nd round of the WFA playoffs at Santana High School. Kickoff is at 5:30pm. The Surge defeated Pacific 49-0 less than 2 weeks ago to sweep the regular season series. The first game took place back in May 5th where the Surge picked up a 69-12 victory. Those were the only points they allowed all season. While the Surge enjoyed a first round bye this past weekend, Pacific had to defeat the Las Vegas Showgirlz 27-20 to earn the right to play in this game. The winner of this match up will face the Central Cal War Angels or Bay Area Bandits in the American Division semifinals on July 7th.